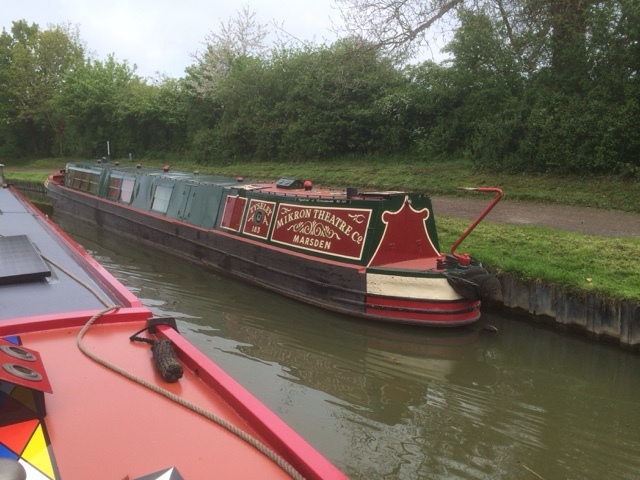 On Thursday 19/5 we departed Welford after topping up the water at the end of the arm. As we winded we saw a narrowboat belonging to the Mikron theatre who travel the waterways putting on shows. There is to be a beer festival at the Wharf Inn in mid June and the Mikron are booked to perform. 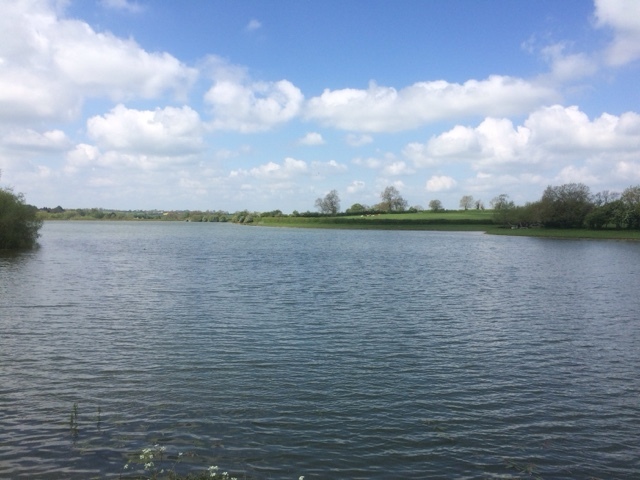 During our time at Welford we explored the reservoirs that feed water into the canal system, and following our exercise we sampled the pub food on offer. After passing through the single lock we arrived at the junction turning left for Yelvertoft, then enjoying a two half hour cruise through the countryside. We took up a mooring just after bridge 21 and this would be my spot whilst the two legged crew abandoned ship for the weekend. Myself and the furry crew member spent the weekend doing our chores ( relaxing ) and also doing a spot of fishing. On Wednesday 25/5 the ships company back to full strength we made the short hop to Yelvertoft marina and our pre booked berth for the week. We are now safely secured and looking forward to visiting the Crick Boat Show. Having spent the weekend very close to our winter home, making use of the car to go shopping, and also taking a trip to The Folly at Napton for Sunday lunch, it was time to move on. We had no hard and fast plan today, we would just see how it went. The mooring between bridges 27 and 28 which is a regular spot for us was busy, so on we went. By the time we reached Welford Junction the sun was still warm, so we decided to go along the Welford Arm to the end. We turned right just ahead of another boat heading from the direction of North Kilworth, and entered a shaded leafy overgrown section of canal. Rounding a bend in the canal, we saw a familiar large white and brown dog. It was Winston, closely followed by our friends from nb Cream Cracker, walking towards the junction. This was a pleasant surprise, which became even more pleasant when we arranged to meet later in the garden of the Wharf Inn for afternoon drinks. 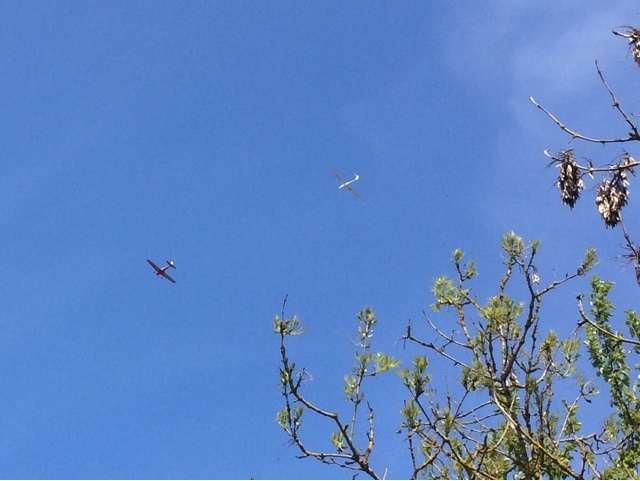 Close to Welford there must be an airfield with a popular gliding club, as we often see the tug aircraft towing a glider, only to return a few minutes later minus its load, ready for the next one. This one is still on its way up. We will stay here a day or two before returning towards Yelvertoft ahead of the weekend, when the two legged crew is planning to abandon ship for a few days. Me, and the furry crew member have already planned our relaxation schedule. We departed Norton Junction at about 9.30 this morning heading towards the Watford lock flight. As we approached it became apparent there was a queue, and we were number three. There was also one more boat in the flight going up, and three more on their way down which we would need to wait for. Still, at least it was warm and sunny. About an hour later we were on our way up. The flight was manned by volunteers, who helped with our progression through the central staircase section. We had been close to the M1 for a while, but once through the top lock, we passed beneath the motorway and soon left the noise behind us. Although we'd had a bit of a wait, it is nothing like the wait people will have in a couple of weeks time, when all the Crick Boat Show traffic is on the move. It is one of the reasons we have returned to the summit level a tad early. Then it was Crick tunnel, wet as usual, but not as bad as it has been previously. Passing Crick Marina we were soon on familiar water, rounding Cracks Hill and Yelvertoft. We passed our winter home, noting our usual berth is currently empty, and then stopped for water by bridge 19. Whilst waiting we had a bite to eat, then it was on again, about half a mile to our intended mooring spot. 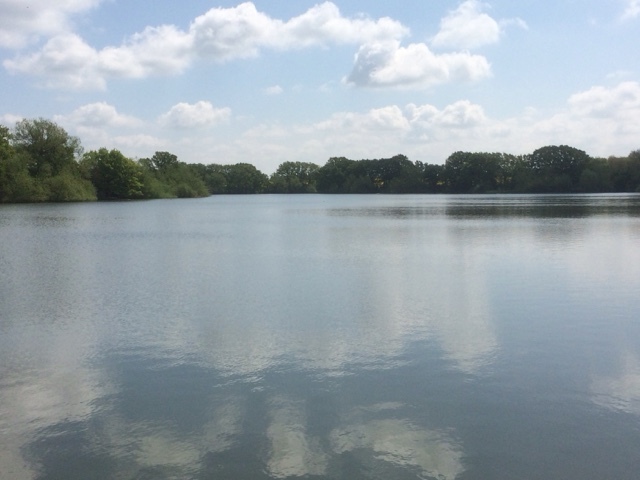 We don't have any hard and fast plans now until the Crick Boat Show, so will spend a few days here and there on the summit level, before returning to Yelvertoft Marina. Having arrived in the pound below Buckby Top Lock, we intended to stay put a couple of days due to forecast rain. We have stayed in this pound previously, and the water level does tend to drop during the day, as boats use the flight. This time however, everytime a boat came up the flight draining a lock of water from the pound, we found our boat listing quite severely. During Tuesday I had to run some water down from the top lock 4 or 5 times, just to maintain a reasonable level. Discussing the issue with the volunteer lock keepers the problem has been caused by CRT removing a course of bricks from the bywash, thereby lowering the maximum water level held in the pound. Consequently today we moved. 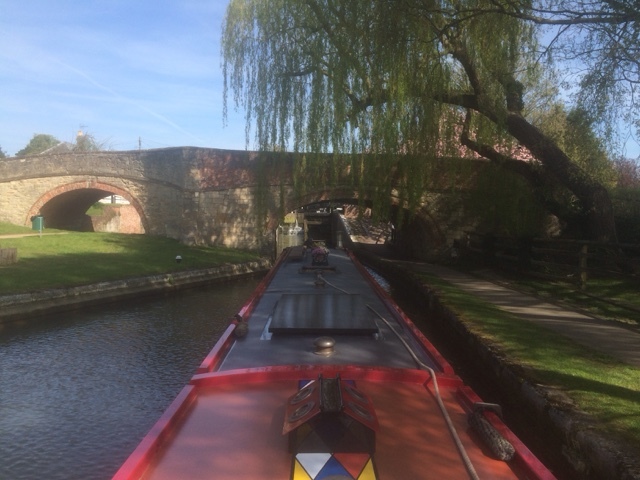 Once through Buckby top lock, the last of the wide locks, it was only a few hundred yards to Norton Junction where we turned left onto the Leicester Line G.U. We moored in our usual spot, and are now well placed for our trip up the Watford flight, and on towards Yelvertoft tomorrow. Even though we only spent a short time near the canalware shop, it was hard to resist having a look inside. 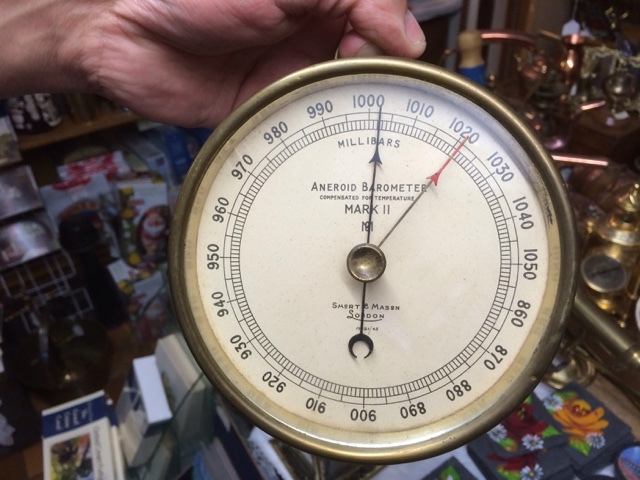 We have been looking for a barometer for a while now and this old model caught our eye. Now we just have to find a suitable bracket to mount it in our back cabin. 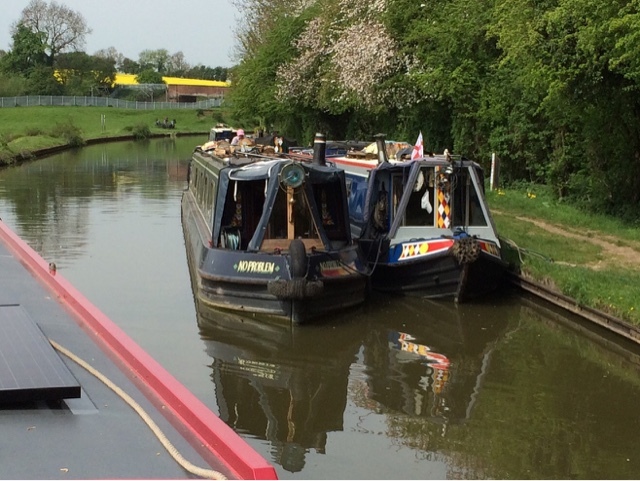 We spent a pleasant weekend moored close to Nether Heyford, but today it was time to move on. The mooring we had is now recorded in our book as a good spot, it is nice and rural, with some good walks and fairly close to a pub. The towpath is wide and grassy, so plenty of room for the four legged crew to play. 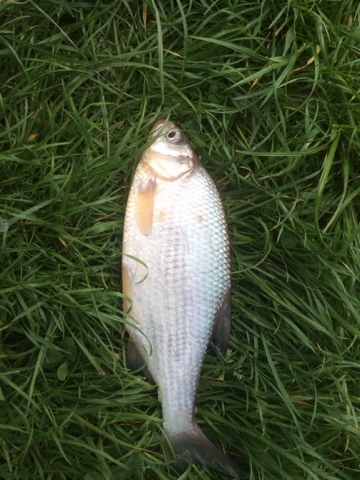 The fishing however is rubbish. Three days spent, and not a single bite. Clearly all the boat traffic had an effect. On the Saturday we walked to the Old Dairy Farm in Upper Stowe. It was until that point, the hottest day of the year so far, and the clue was in the name, Upper. It was uphill all the way. The centre has a collection of small farm buildings surrounding a courtyard. There is a selection of arts and crafts shops to visit and also a restaurant for refreshments. Old Dairy Farm, Upper Stowe. Due to it being so hot and a bit of a hike, the furry crew member had been left to relax in the relative coolness of the boat. 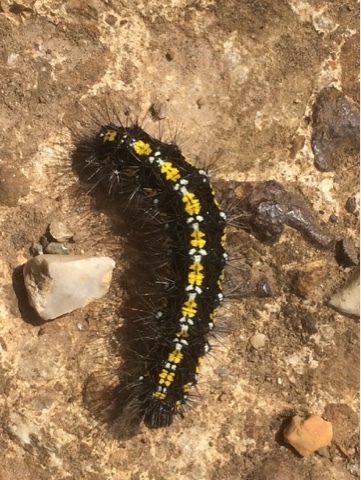 I therefore knew it was not him tickling my neck, and it certainly wasn't the two legged crew, which is when I found this crawling on me. On Sunday as stated we went to the Narrowboat P.H. for our roast dinner. Just as well we booked as it was packed. The rest of the day was then spent lounging around, not catching fish. Today we set off at about 9 am. Our first stop was at rugby boats for a pump out, then a further short hop to the water point to replenish the tank. It was here that we met blogging royalty, nb. No Problem accompanied by nb. Seyellas Journey. Both these write far more extensive blogs than ours, and can be found in our blog list. We have met Seyellas Journey before but this was a first for No Problem. Their blog was one of the first we read whilst doing our initial research into a life afloat. Nb. No problem and Nb. Seyellas Journey. On completion of the tank filling it was on towards the Buckby flight of locks. Seven in all, but we only planned to go up six today. At the foot of the locks we found ourselves alone for the ascent but as it was lunchtime we thought we'd stop. Just as we finished lunch another boat passed us towards the locks and this was our locking partner. Not only did we now have another boat in the lock, but this singlehanded lady boater had friends, who she had phoned, and they turned up to help so the crew was assisted in their duties today. 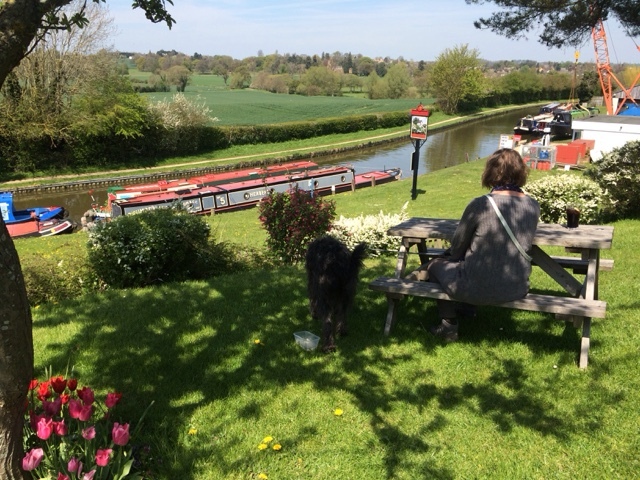 Once at our mooring spot it was into the shop for a well earned ice lolly, then off to the pub for a cold drink. It's forecast to rain tomorrow so we will stay put a day or so. We now have only one more wide lock to do before returning to home waters. After breakfast we set off from Stoke Bruerne. The day was already warming up as we approached the locks. Fortunately the crew only had two to do today. We got logged by the CRT, I suspect Stoke Bruerne, as a tourist hotspot is frequently checked, to ensure time limit compliance. Approaching the top lock a huge willow tree hangs over the canal. It won't be long before it obscures the view completely. Once through the locks it was a short hop to the entrance of Blisworth Tunnel. As previously stated, it is arrow straight and we could see the light of the portal at the further end. There were no oncoming boats. This situation lasted until we were about 200 yards from the exit, when three boats entered in close succession. Unfortunately for us, boats one and two could not steer straight, and both hit us hard. We heard the clattering of glass or chinaware, and the second boat lost a windlass from its roof. No damage to us, just a few more scuff marks to our blacking. Once out of the tunnel, we had about five miles of cruising through the countryside in glorious sunshine to enjoy. 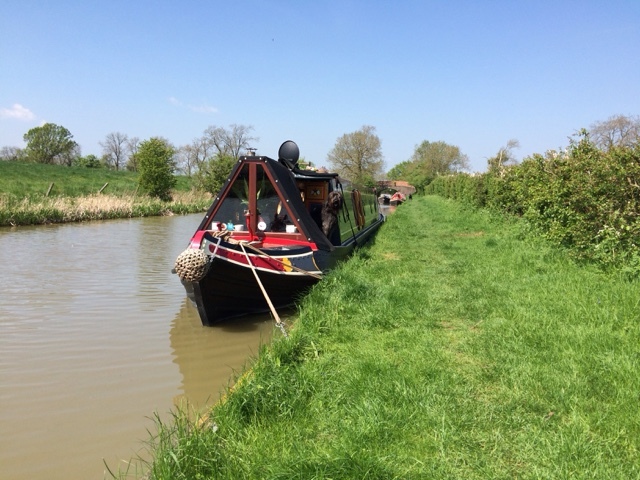 We found our chosen mooring spot empty on arrival, so we quickly secured the boat then went for a walk towards Stowehill and The Narrowboat P.H. The weather was perfect for lunch in the garden overlooking the canal. Our plan is to remain here a few days and to review the Sunday roast provided by The Narrowboat P.H. Once back at the boat the afternoon spent lazing about on the towpath in the sun. We are now back in the pound below the Navigation Inn at Stoke Bruerne. We expect to stay here only a couple of days, although we are allowed up to seven in this spot. Leaving Cosgrove this morning the sun was doing its best to shine through some light cloud, but the forecast heatwave is yet to arrive. After ascending the lock at Cosgrove, we had a pleasant six mile cruise through the countryside, picking out some nice rural mooring spots for future reference. During the last mile before the Stoke Bruerne flight, we caught up with a CRT ( Canal and River Trust ) dredger which was weaving along. Square shaped with a large digger bucket on the front, they don't look the easiest things to steer in a straight line. Fortunately we needed a tank full of water so we stopped at the base of the lock flight to fill up. The CRT crew asked if we were going up, to which we replied "yes, in about 40 minutes". They didn't want to wait. We had lunch whilst waiting, then it was on up five of the seven locks. Tonight a visit to the Spice of Bruerne is on the cards for a takeaway curry. Tomorrow the weather is reported to be glorious, so a day of gongoozerling, ( boat watching ) whilst sitting outside one of the pubs will probably be the order of the day. 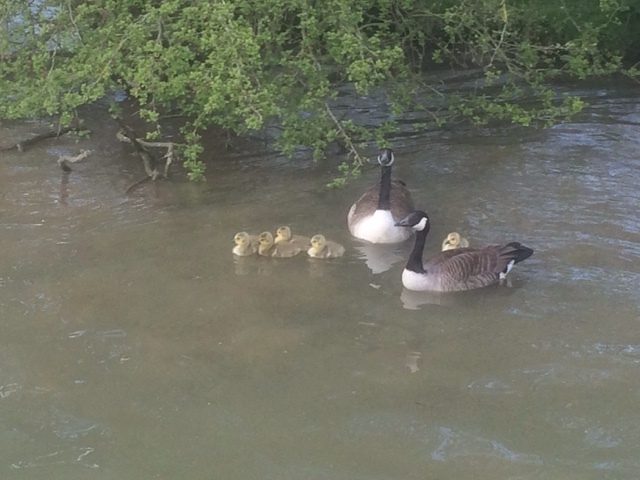 So far on our travels this year we have seen numerous ducklings and today we saw our first batch of goslings, just the cygnets to go. Our first batch of goslings this year. On Friday we set off from bridge 75, aiming for the visitor moorings below the lock at Cosgrove. 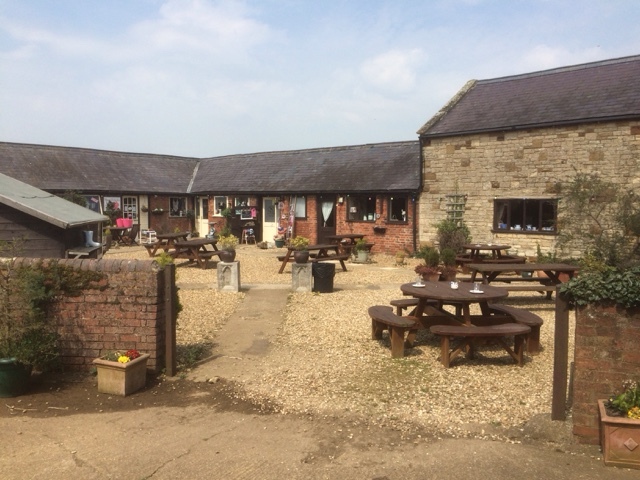 We thought the area may get busy due to the weekend being a bank holiday, however it has been the opposite, we were spoilt for choice as to where we wanted to moor. 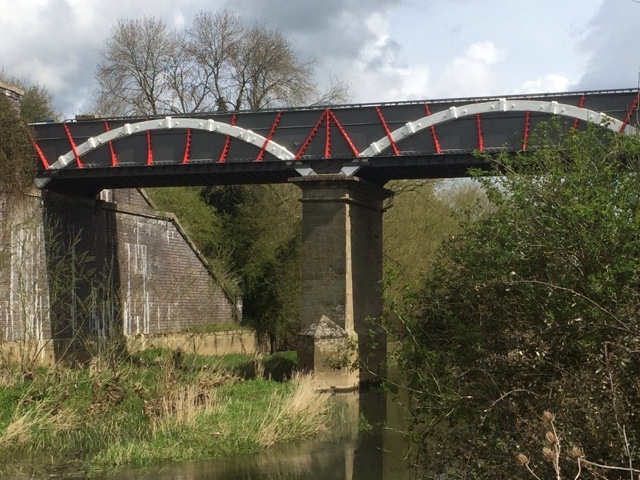 Whilst here we have walked both directions along the bank of the river Great Ouse, which is accessible by descending steps at the Iron Trunk Aquaduct. Looking from the river valley back towards the canal. We also visited Stony Stratford, a small market town on the outskirts of Milton Keynes and found that it's high street still had an abundance of useful shops. Of course Sunday involved having a roast dinner at the Barley Mow P.H. Today, the weather was forecast to be a bit wet, however most of the day has been very pleasant. We visited an old curiosity shop at Wolverton Wharf, and gave the boat a wash so all in all a productive day. Tomorrow we are aiming for Stoke Bruerne and possibly a nice Indian takeaway.